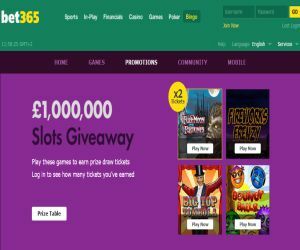 bet365 Bingo's £1,000,000 Slots Giveaway | Win your scorching share! Lord Bingo News Bingo Promotions bet365 Bingo’s £1,000,000 Slots Giveaway! bet365 Bingo’s £1,000,000 Slots Giveaway! Kick-start the holiday season early with bet365 Bingo‘s £1,000,000 scorching Slots Giveaway! While it's time to put your scary Halloween costumes safely in the closet for next year, the good news is that it's almost the holidays! So what better way to save up for the extravagant holiday season, than to win up to £60,000 in fire-cracking cash prizes! The bet365 Bingo's £1,000,000 Slots Giveaway runs all month until 27th November, and offers the awesome chance to scoop your share of £1 Million! The best news is that there are eight hot prize draws, so you'll have multiple chances to win some sizzling cash! For your chance to earn prize draw tickets, all you have to do is stake £10 on any of bet365 Bingo's qualifying games. You can also earn two prize draw tickets if you wager on any of the Double Ticket Games. These include Full Moon Fortunes, The Winnings of Oz, Clover Rollover and Wild Gambler. In each draw, you'll have the chance to win up to £5,000, and you can also have multiple chances to win multiple prizes! So make a note in your diary, and make sure you don't miss the prize draws. These will be hosted on 4th, 7th, 11th, 14th, 18th, 21st, 25th and 28th November 2016. The cherry on the top is that you'll never have to miss a win, as you can log in and spin on your desktop, mobile and tablet!